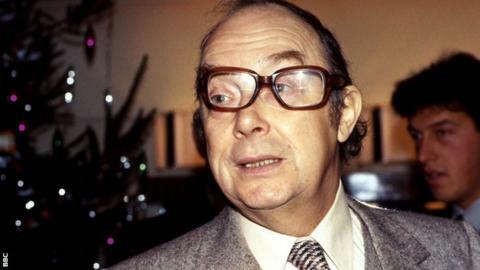 It was the scoreline that the late, great Eric Morecambe always used to joke about but had never come true - until now. East Fife 4 Forfar 5 was the much-loved comedian's idea of the ultimate tongue-twister for anyone trying to read out the football results. On Sunday, that result finally happened for the first time in the fixture's history - sort of. The Scottish League Cup Group B tie between the sides went to penalties after a 1-1 draw. And the score in the shootout? East Fife 4 Forfar 5. Had he lived to see that, it would surely have raised a smile from Morecambe, who came up with the score as a jokey greeting whenever he met his friend James Alexander Gordon, the popular announcer who read the classified results on the BBC for 40 years. "Eric never called me James," Gordon, who died in 2014, once recalled. "Whenever I saw him over a 20-year period, he would say 'East Fife 4 Forfar 5'. I've got a tape of that." Before Sunday, there had been two occasions when the scoreline almost occurred. In April 1964, it happened with the wrong team at home - finishing Forfar 5 East Fife 4. And in October 2011, a meeting between the sides ended East Fife 4 Forfar 3. Anton Dowds claimed the opener on Sunday for East Fife, who had Chris Kane sent off before John Baird equalised. Group games go to penalties under the League Cup format. With the shootout score at 4-4, Forfar keeper Marc McCallum saved Daryl Meggatt's kick before Thomas Reilly converted to seal a bonus point for the visitors - and make a little piece of sporting history. Match ends, East Fife 1(4), Forfar Athletic 1(5). Penalty Shootout ends, East Fife 1(4), Forfar Athletic 1(5). Goal! East Fife 1(4), Forfar Athletic 1(5). Thomas Reilly (Forfar Athletic) converts the penalty with a right footed shot to the centre of the goal. Penalty saved! Daryll Meggatt (East Fife) fails to capitalise on this great opportunity, right footed shot saved in the bottom left corner. Goal! East Fife 1(4), Forfar Athletic 1(4). Dylan Easton (Forfar Athletic) converts the penalty with a right footed shot to the bottom left corner. Goal! East Fife 1(4), Forfar Athletic 1(3). Anton Dowds (East Fife) converts the penalty with a right footed shot to the bottom left corner. Goal! East Fife 1(3), Forfar Athletic 1(3). Ross Meechan (Forfar Athletic) converts the penalty with a right footed shot to the top left corner. Penalty saved! Ross Davidson (East Fife) fails to capitalise on this great opportunity, right footed shot saved in the bottom left corner. Goal! East Fife 1(3), Forfar Athletic 1(2). Dale Hilson (Forfar Athletic) converts the penalty with a right footed shot to the bottom left corner. Goal! East Fife 1(3), Forfar Athletic 1(1). Brett Long (East Fife) converts the penalty with a left footed shot to the bottom left corner. Penalty saved! John Baird (Forfar Athletic) fails to capitalise on this great opportunity, right footed shot saved in the centre of the goal. Goal! East Fife 1(2), Forfar Athletic 1(1). Aaron Dunsmore (East Fife) converts the penalty with a right footed shot to the top right corner. Goal! East Fife 1(1), Forfar Athletic 1(1). Andy Munro (Forfar Athletic) converts the penalty with a right footed shot to the bottom right corner. Goal! East Fife 1(1), Forfar Athletic 1. Craig Watson (East Fife) converts the penalty with a right footed shot to the bottom right corner. Penalty Shootout begins East Fife 1, Forfar Athletic 1. Second Half ends, East Fife 1, Forfar Athletic 1. Anton Dowds (East Fife) wins a free kick in the attacking half. Attempt missed. John Baird (Forfar Athletic) header from the centre of the box is close, but misses to the left. Attempt saved. John Baird (Forfar Athletic) right footed shot from the centre of the box is saved in the bottom right corner. Substitution, Forfar Athletic. John Kelly replaces Michael Travis. Attempt missed. Thomas Reilly (Forfar Athletic) right footed shot from the centre of the box is high and wide to the right. Craig Thomson (East Fife) wins a free kick in the attacking half. Attempt missed. Craig Thomson (East Fife) right footed shot from outside the box is too high. Substitution, Forfar Athletic. Darren Whyte replaces Gary Fraser. Corner, Forfar Athletic. Conceded by Ross Dunlop. Substitution, East Fife. Patrick Slattery replaces Scott McBride. Substitution, East Fife. Craig Thomson replaces Scott Agnew. Attempt saved. Murray MacKintosh (Forfar Athletic) right footed shot from outside the box is saved in the bottom left corner. Corner, Forfar Athletic. Conceded by Brett Long. Attempt saved. Gary Fraser (Forfar Athletic) right footed shot from outside the box is saved in the top centre of the goal.